A 1988 poll by a New York-based newsletter, Journalist and Financial Reporting, surveyed 151 business reporters from over 30 publications ranging from the Los Angeles Times, Washington Post, USA Today, New York Times and Chicago Tribune to Money, Fortune and Business Week. The survey found that newspaper and magazine business reporters are just as liberal as their colleagues covering politics. 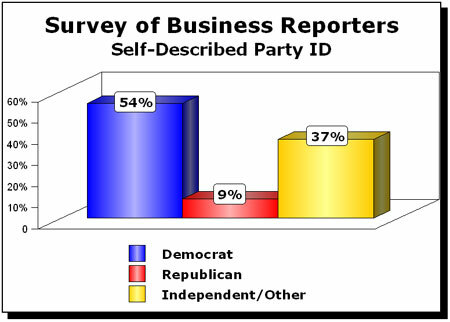 54 percent identified themselves as Democrats, just nine percent as Republicans. 76 percent reported they opposed school prayer and 75 percent were against aid to the Contras, rebels fighting the Communist-backed Nicaraguan government. An overwhelming 86 percent favored abortion. More than half of the reporters, 52 percent, evaluated President Reagan's performance in office as 'poor' or 'below average.' Only 17 percent gave him an 'excellent' or 'good,' while 19 percent considered him 'average.' By way of comparison, Reagan's average approval rating among the public during 1988 was 53 percent positive, according to Gallup. Asked who they wished to see elected President that year, 27 percent named liberal New York Governor Mario Cuomo (D), followed by Democratic Senators Bill Bradley (20%) and Paul Simon (9%). Senator Bob Dole was the most 'popular' Republican, garnering a piddling eight percent. Rev. Pat Robertson, then a GOP candidate, topped the list — at 44 percent — of those the reporters would 'least like to see as President,' followed by 19 percent who named the eventual winner, George H. W. Bush. Next: Exhibit 1-6: Journalists - Who Are They, Really?